Spring is a time of contrasts – it can be bitterly cold one day and blisteringly hot the next – and this is reflected in some of the fashion trends we’ve been seeing on the catwalk recently. Here, we take a look at what’s hot – and cool – on the catwalk, and how you can dress for the weather, and still look fabulous this Spring. Paco Rabanne, Valentino and Giambattista Valli were among some of the big names who went with an “East meets West” bohemian vibe, bringing us long-sleeved, full-skirted dresses in a variety of colours and finishes. 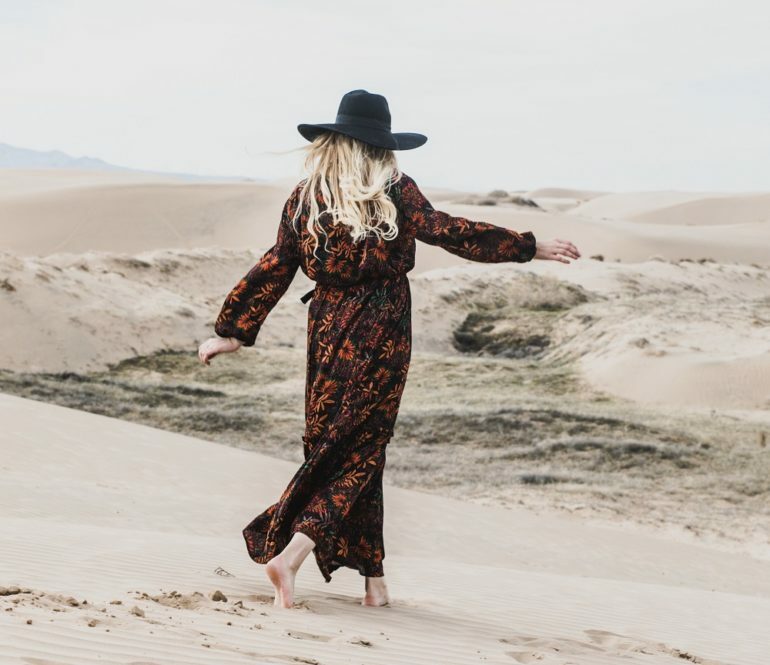 Maxi dresses are a great way to deal with changing temperatures as they can be worn on their own or teamed with a cardigan or jacket on cooler days. We also spotted a Michael Kors denim shirt dress, worn with sandals in New York but we think it would be equally at home with knee boots on cooler days. Many designers have also been harking back to the 80s with powerful shoulder pads, puff sleeves and slouchy boots. Many designs in the 80s were seen as “futuristic” and we thought that Sally LaPointe’s see-through mac which manages to be both practical for April showers, and hitting just the right note of retro-futuristic. Equally good for those damper Spring days is the trench coat and this year saw Proenza Schouler, Gabriela Hearst, Jonathan Cohen, and of course Burberry, amongst the designers showing off their take on this dependable classic. Whether keeping it classic, cinching it in with an oversized belt or scaling the whole coat up we welcome trends that allow us to stay stylish and dry at the same time! Back in London, designers such as Erdem were wowing us with trouser suits, with 80s shoulder lines but longer length jackets to give a smoother silhouette. Shown with smart shoes, we think they’d still look great with ankle boots on cooler or wetter days when you need a bit more protection during the commute. One of the best for versatility, we loved the wearability of Victoria Beckham’s ready-to-wear collection which was also harking back to an earlier time with 90s inspired dresses over trousers and lots of layering – a stylish look for changeable weather. Her eminently practical large tote bag gives you plenty of space to stash unwanted jumpers on those annoying freezing in the morning but sweltering by lunchtime days, as well as finishing off her outfits perfectly.